I find it strange that carbon dioxide is identified as the main culprit in global warming. Many might find this statement outrageous. It is after all, a greenhouse gas, and the carbon dioxide hothouse that is Venus is incontrovertible proof of what can potentially happen to the Earth if there is too much carbon dioxide in the atmosphere. Venus has an atmosphere that is 96.5% carbon dioxide. 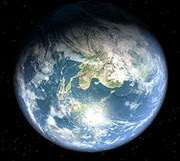 Earth's carbon dioxide content is only at .03%. There is a big difference. 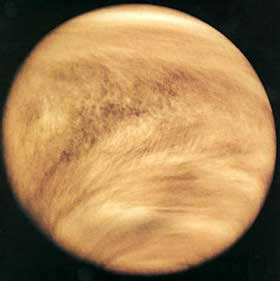 If you think that carbon dioxide is already turning the Earth's atmosphere into a furnace, wait till you get to Venus. It is a smelter. The greenhouse effect there produces enough heat to melt lead on the surface! 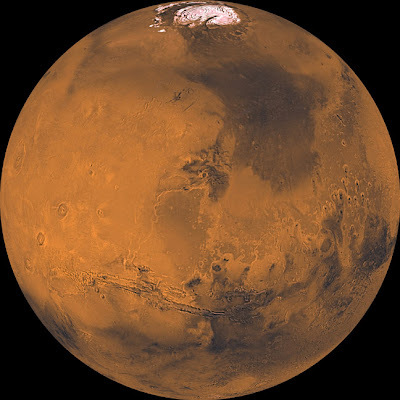 The reason why I think it's strange is that Mars is cold, with a temperature range of –140 °C (−220 °F) to 20 °C (70 °F), even with an atmosphere that is 95% carbon dioxide. That's almost the same as the level on Venus. Why is it that the greenhouse effect works differently on Mars? Of course, there can be many answers to this question. Things like the low gravity, distance from the Sun, atmospheric pressure, environmental particulates, and even the dryness of Mars may be to blame. Still, there seems proof that Mars was once like Earth, a very warm and wet one at that. What made it turn cold and dry even with the extreme level of carbon dioxide it has? It's hard to imagine Earth turning into a Venus. On the other hand, it's also unappetizing for us to imagine that our planet is turning into a frigid desert like Mars. But whatever the outcome, I do like to think that it is possible for us to counter the effects of global warming and even make it stop. But it requires a concerted global effort. Scientists believe that it is possible to terraform Mars into something like the Earth with a breathable atmosphere of oxygen by seeding it with carbon-dioxide-feeding blue green algae. I'm not an expert, but if simple algae can change a whole planet, then maybe we can just plant trees and ease on using fossil fuels. It's possible this warming trend is only temporary. If that’s the case, then we really have little to worry about. The Earth's climate has cooled and warmed in the past even without the artificial infusion of greenhouse gases. The most dramatic change was in the last million years during the last ice age, which ended only 10,000 years ago. It was then that the Earth warmed, humans migrated, and species disappeared. Changes were happening as late as medieval times. 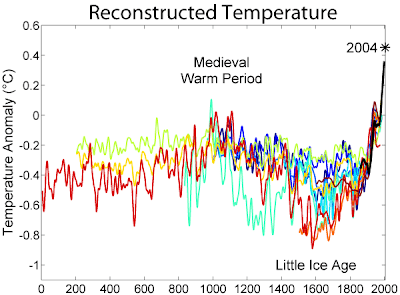 The Medieval Climate Optimum is one example. This was a period of warmth, particularly in the North Atlantic Region, that lasted between the tenth and fourteenth centuries. It was followed by what is now known as The Little Ice Age in Europe. Considering these things, climate change may really be a pretty normal thing for the Earth to go through. The urgent question now is whether we have the will to act on global warming, or will we be lukewarm to it? The decision will be hard as economic factors will have to be considered. But if our fervor for the cause is as hot as the Earth is getting, we may yet pull through. Many individuals and groups have found great content on global warming in TheNewsRoom like the one provided in the link. There are thousands more available that you can use to promote awareness on the subject. If you'd like to know more, email jtowns@voxant.com. TheNewsRoom is happy to be your partner against global warming. For an in-depth discussion on this, go to the CNET forum. Global "Warming" effectively ended in 1998, and we've been in a cooling trend for the past decade, despite increasing levels of CO2 in our atmosphere. In fact, CO2 lags, not leads temperature changes in all reliable datasets. That means CO2 is a result, not a cause of global warming. ( Hint: most of the earth's CO2 is locked up in the oceans, which absorbs it when cooler, and releases it when warmer ). So, I'm wondering: Why the appeal for assistance in finding a cure for a nonexistent disease?